What a perfect way to see the best of London in the ultimate London icon, a black cab. Graham is your driver and a trained guide who has a history degree. Black cab drivers have to know every street within a 6 mile radius of the centre of London as part of the "knowledge". More important than any of that Graham is passionate about the London he knows so very well and his enthusiasm is infectious. I now know that the centre of London is not really Trafalgar Square but is actually the statue of Charles I in Whitehall. To be absolutely correct it is the raised hoof of the horse he is riding and all distances are measured from here. Want to know anything about the Beatles? Hendrix? maybe Dickens or Shakespeare? Architecture? Graham's your man. Check out his web site for information on all his tours. p.s. if you ask him really really nicely he just might let you sit for a moment in the front seat of his cab. If he does make sure you have your camera for a photo you can show off back home. Ah, all very well, but does his 'Knowledge' stretch to the fact that spray can upholstery cleaning fluids would make his passengers ill?? Many is the time that I have lost 48 hours because a cab driver was houseproud. Not as funny as it sounds. Those aerosols in a contained area can make some people awfully sick. These days I just walk. Or go places on my bike if I am lucky enough to have been able to bring it along. Great idea. After all London taxis are iconic. I've not met Graham... but now I want to! Wow Mo, this sounds like a fantastic thing to do. I've taken a few walking tours from a group called "London Walks" and really enjoyed those. This sounds even more fun. I will remember this for my next visit. Great post Mo. Thank you. Definitely a must do while in London. I have never taken a black car trip around London, but your post is making it sound very appealing. I think of taxis as ways to get from A to B. Silly me. Taxi drivers do know everything! Those that don't still talk as if they do! 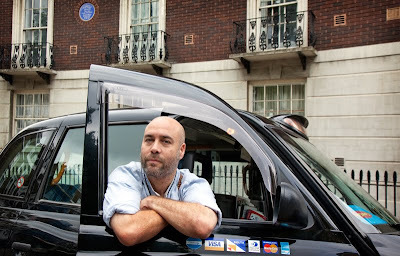 One thing, in my 21 years there I was never cheated by any black cab driver, and as I knew my way around I knew they always took the best route. Hee ee. I also did not know that about Charles I's statue! Great post and great points raised thanks for sharing!! !